One of the goals that most all humans share is finding our place in this world. We long to discover and understand that niche in life that allows us to live the life we want and be happy while doing it. This is the personal tale of someone who, at a young age, came to the decision that the way to find her place in the world was to explore every inch of it in order to have no regrets…and not by using the Internet Superhighway in order to accomplish her journey. R.K. didn't have the worst life as a child, but she had a rocky road. In grade school some made fun of her name, so she changed it; her father was an addict and an abuser, while her mother was a good woman who worked incredibly hard in order to leave the welfare world and ended up becoming one of the 'best' in a very tough industry. When R.K. first set out on her journey it was not to run away or spit in her mother's eye, or any of that. She was, in fact, twenty years old and wanted to simply travel. She received that chance when a friend of her boyfriend stopped by and began to discuss how he hitchhiked from location to location and attended Rainbow Gatherings (which is an organization begun in the seventies where people came together to pray, protest violence, sit in circles and say 'ohm' - you get the drift). It's also a place that brings together people from extremely varied backgrounds and allowed R.K. - someone who was afraid to be stuck in a boring 9-to-5 life - a chance to have a life of excitement, see the world and find herself in the process. 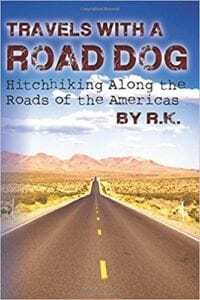 Readers journey alongside R.K. as she hitchhikes. The stories/situations that are told will resonate with many as R.K. makes friends, travels with canine companions who are usually more soothing than the humans, and rides along with truckers, good people, bad people and, once in a great while, a scary person. Although there are ups and downs, R.K. ends up at other Rainbow Gatherings, visits with her mom and sister, sees everything from big cities to small, remote towns to a literally beautiful ride through Mexico, as well as a trip to Venezuela that readers will not forget. In the end, the author offers a memoir that's intriguing because of these locales and the people she meets along the way. Her freedom, her calmness in the face of danger, cold or sickness, her moments of picking through McDonald's waste receptacles for breakfast - all of these chapters come together to form a young life that's filled with adventure, excitement, and learning about oneself. Quill Says: A journey filled with every emotion from humor to loneliness that many readers will surely relate to.